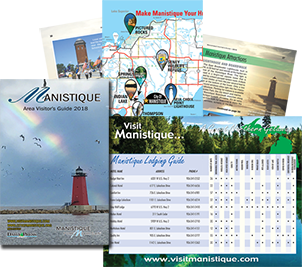 Explore the beautiful Manistique Area with this interactive map and experience breathtaking scenery, four seasons of outdoor sports and numerous historical landmarks. 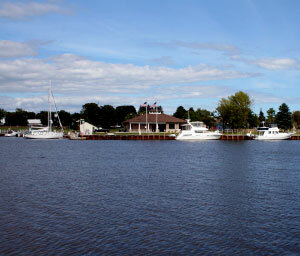 Whatever you enjoy, the Manistique area offers a wide variety of opportunities for vacation fun. Any time of the year is perfect for a visit to Manistique. Summer temperatures along Lake Michigan's northern shore are comfortable, averaging 76 degrees. From quiet walks along white-sand beaches on Lake Michigan to canoeing down a wilderness river to catching a crowd-pleasing summer festival, you can be sure you'll bring home memories that won't soon be forgotten. Manistique and the surrounding areas are an outdoor enthusiast's dream! Colorful scenery, great weather and ample game and pan fish in our many lakes, rivers and bays provides for all kinds of outdoor activities like hiking, fishing, biking, swimming, canoeing, snowmobiling and more. Whether you enjoy nature, boating, fishing, camping, snowmobiling, hunting, shopping, dining or just relaxing, the Manistique area offers a wide variety of opportunities for vacation fun. Photos from Great Getaways taken over the years in Manistique and surrounding areas. 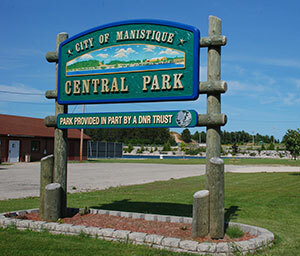 Discover some of the many reasons to visit Manistique, listed here in no particular order. One of Michigan's alluring natural attractions is Kitch-iti-kipi, The Big Spring. "The Big Spring" is the largest in Michigan - forty feet deep and over 10,000 gallons of clear water gush per minute from the fissures in the underlying limestone. 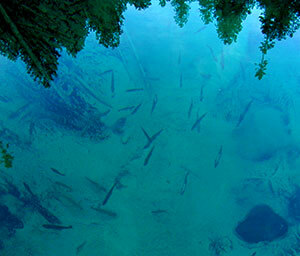 Crystal clear, 45 degree water supports a large raft from which you can view this beautiful, giant spring and its inhabitants. 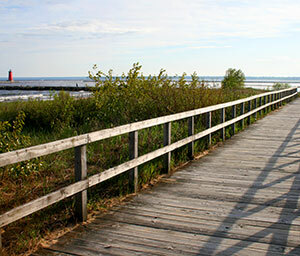 Stroll along just over two miles of Lake Michigan shoreline on the Manistique Boardwalk. 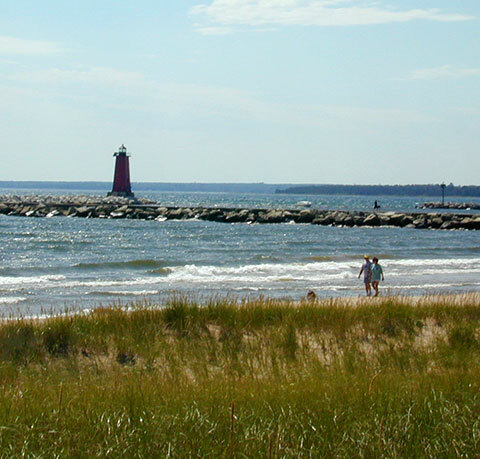 This wood and cement walk features three bridges, several benches, a fishing pier, observation areas and a great view of Manistique’s Breakwater Light. Watch beautiful sunrises and sunsets at your quiet leisure. You will see the top of Lake Michigan, beach and long grass on one side of you and trees on the other. (Garden, MI) This well-preserved museum village recalls another time when it was a bustling iron smelting company town. 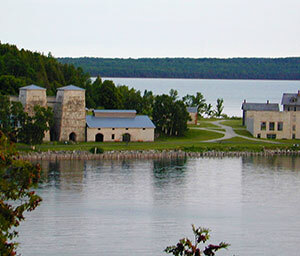 Fayette offers visitors the unmatched serenity of a Lake Michigan harbor, white cliffs and verdant forests. (Gulliver, MI) Brick light tower originally built in 1895. 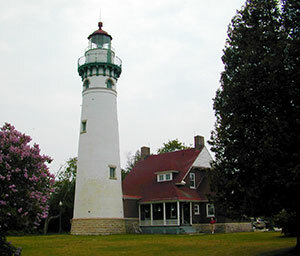 Tower tours are available and visitors are welcome to enjoy the surrounding grounds, which includes a picnic area, walking paths, and public boat launch. Here, you will find a home town atmosphere right along side of the Vegas style table gaming and your favorite slot machines. While entertaining at our casino, enjoy dining at our Mariner's Cove restaurant or relax and take in a sporting evening at our Team Spirits Bar. Also featured here for guests convenience is a gift shop, free parking, and our Northern Rewards Players Club. 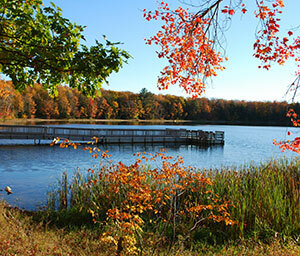 Indian Lake State Park is located on Indian Lake, the fourth largest inland lake in the Upper Peninsula with an area of 8,400 acres. It is six miles long and three miles wide. The lake was once called M'O'Nistique Lake. According to 1850 surveyor records, Native Americans lived in log cabins near the outlet of the lake. The park is composed of two units which are three miles apart and separated by the waters of Indian Lake. A hiking trail that passes through maple, yellow birch, and mixed conifer habitat takes hikers over boardwalks and through wet areas, leading to an elevated observation platform that provides a feeling of remoteness with outstanding opportunities for viewing wildlife. 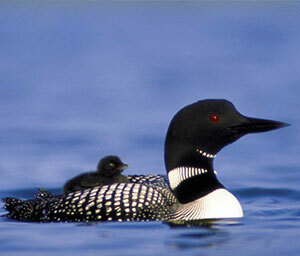 Throughout this nearly 96,000 acres of diverse habitat live a wide variety of wildlife species. 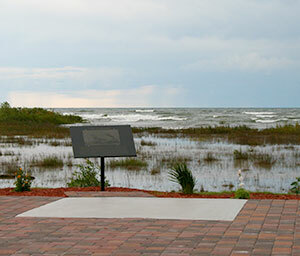 Programs, guided tours and visitor center exhibits help you learn about refuge habitats and wildlife. 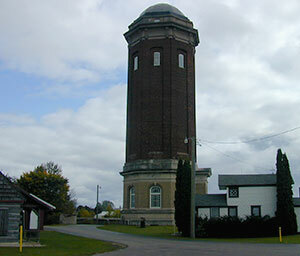 (Manistique, MI) The 137-foot-high Romanesque brick water tower dates from 1922 and now houses the Manistique Historical Society’s book and gift shop, plus displays about the town's business and civic history. 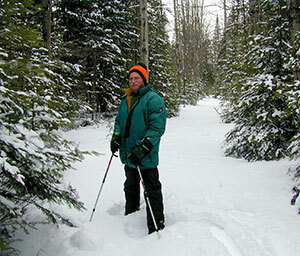 (Manistique, MI) A system of trails located on 80 acres of wooded township land. The purpose of the Lab is to provide hiking, nature appreciation and environmental education opportunities for the general public and local schools. 'Manistique On The Harbor' is a unique waterfront tasting room. Sit on the dock and enjoy a glass of wine. 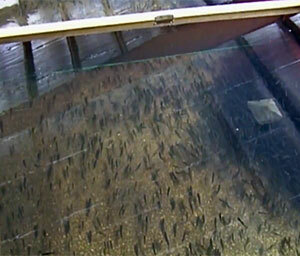 (Manistique, MI) Most of the hatchery's annual production is cold water species such as brook trout, splake, brown trout, rainbow trout and chinook salmon most of which is planted in Upper Peninsula waters. 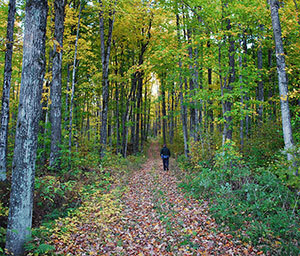 (Hiawatha National Forest) 26 mile system of hiking and horseback riding trails located in the Ironjaw Semi-primitive Area. 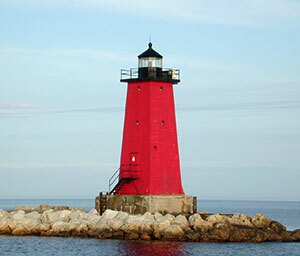 (Manistique, MI) Square pyramidal lighthouse first lit in 1916. 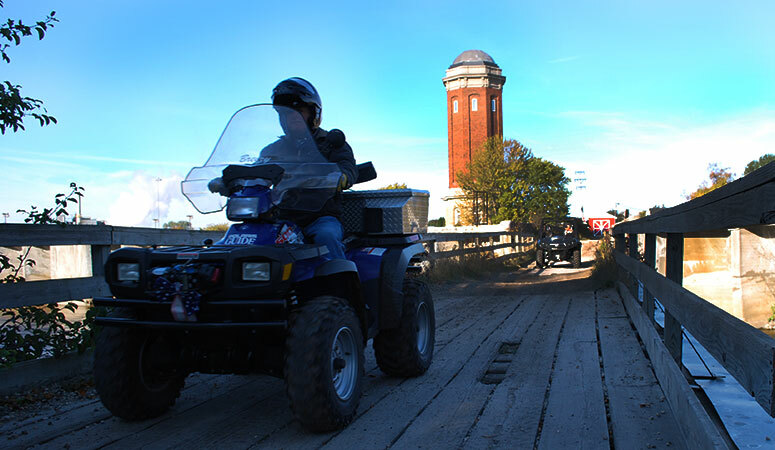 The Manistique Boardwalk offers its users a fishing pier, access to the east breakwater light, picnic grounds, and abundant nature and wildlife to enjoy. 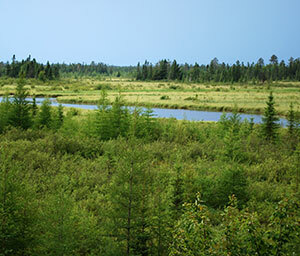 (Hiawatha National Forest) This 2 mile long loop trail meanders along the edge of Colwell Lake and is surfaced to be fully accessible to people with mobility impairments. 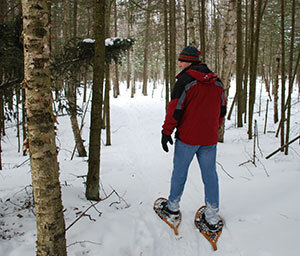 The trail is particularly stunning in the fall, and also is popular in the winter as a snowshoe trail. (Thompson, MI) The silent stones of the dock are the final monument to the last port of call of the famous "Christmas Tree Ship", the Rouse Simmons. 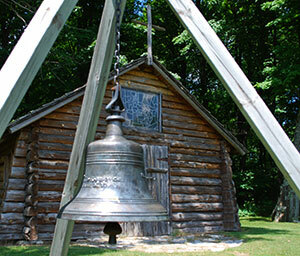 (Manistique, MI) The Bishop Baraga Shrine near Indian Lake includes a chapel, Indian dwellings, and buildings open to the public plus Indian burial grounds. (Manistique, MI) From an old limestone quarry has emerged a nice swimming lake surrounded by a city park with beach, picnic area, playground, tennis courts & more. Built in Spring of 2014, with a Harbor Masters building, local information, air conditioned lounge area, WIFI, laundry facilities, bathrooms & showers, diesel fuel and security cameras for our transient boaters. This is the beginning of the Boardwalk where there are fishing piers available and access to the East Breakwater Light. 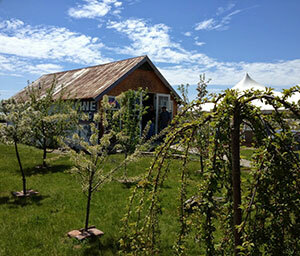 Mackinaw Trail Winery next door. 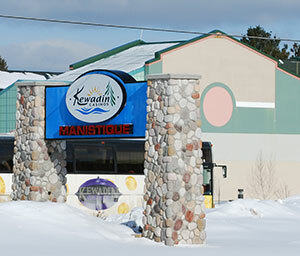 Transportation available until 3am daily to and from Manistique Marina. 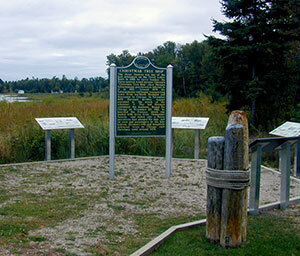 Located on US HWY 2 in Manistique, Michigan, the park was renamed in July of 2014 after the famous Shipwreck of the Carl D. Bradley. The wreck site is located 160 degrees S E and 23 miles off shore from this point. The Rails-To-Trails program will mark its 50th anniversary in 2020 and there are upcoming events on the Manistique area trails to celebrate. The US-2 Top of the Lake Byway runs 85 miles from St. Ignace to Manistique, hugging the picturesque northern shoreline of Lake Michigan. It was chosen for the designation based on its outstanding recreational and scenic qualities.